Bend ’em, twist ’em, even sit on ’em—these memory flex readers are virtually indestructible, returning to their original shape every time! 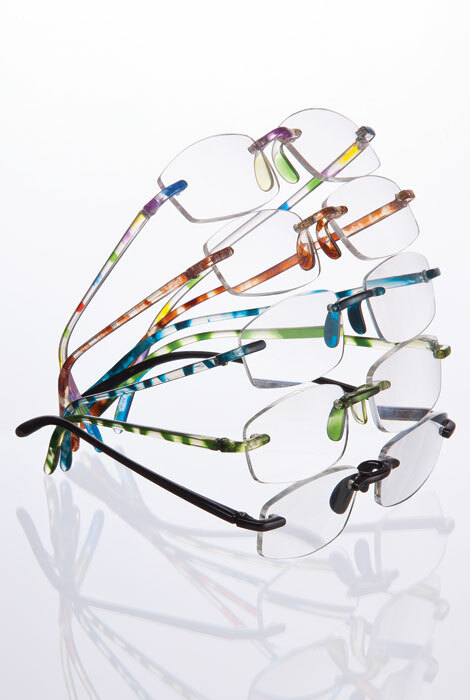 Our flexible reading glasses come in designer colors to match every outfit. 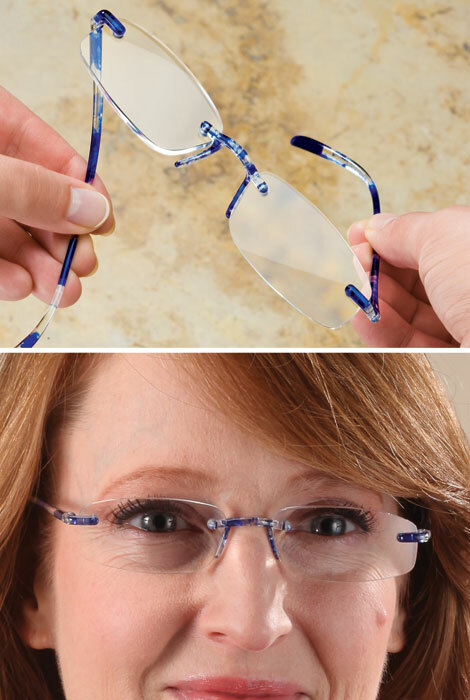 These bendable reading glasses includes a case. 1.5X, 2.0X, 2.5X, 3.0X, 4.0X, 5.0X, 6.0X magnification. Specify Color: Blue, Black, Rainbow, Tortoise and Green. 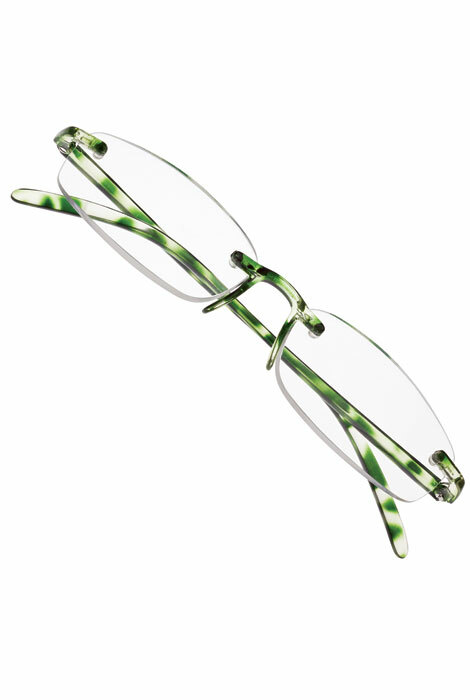 Purchased two pair of these (tortoise color)for myself and they are so light weight, true magnification and attractive! My husband was envious because his readers were so heavy. So ordered him two pair (black color) and he loves them too! Hope this item is NEVER discontinued! They are so comfortable and lightweight. I can even sit on them and they go right back to their normal shape. I got two pair. I keep one in the car and one by my computer. They are light, flexible and perfect for what I need them for. because of the small but sturdy case. I am going to purchase another pair! I bought these glasses for my husband, he is always wrecking his, this one's have withstood his handling them, am really pleased with these. Useful, accurate, finally can see without spending a lot of money on glasses. Good purchase. They were gifts to friends that have MS. They were very please with the power, shape of lense and style of frame. No doubt will order more. With these readers, I have no problem seeing words or music notes on the page. They are so light weight that I don't realize I am wearing glasses, which I love and I think they have attractive frames. I am 100% satisfied with my purchase. In fact, I bought three pair for spares. OOOPS ! Meant to give 5 Star Review last time. This is a Great Item. Does not hurt my head. Love them.. I have 4 pairs. I have an eye condition that seems to require greater and greater close up reading magnification. My prescription glasses have a bi-focal magnification of 3.5 and that is not enough in a lot of circumstances. I often find it difficult to read a hand held book as the print is not clear. So, being an all or nothing person, I ordered the 6X magnification glasses and found that they are too powerful. so then I ordered the 5X & 4X magnification glasses and definitely prefer them. I use the 4X for reading regularly and on occasion I need the 5X. All 3 glasses are a quality product and I am saving the 6X pair for future use, if needed. These glasses in the 4x & 5X have been a real solution to my decreasing sight dilemma. I would definitely recommend these---just start out with the correct magnification that you require. My opthamologist will not prescribe a higher bi-focal strength than 3.5---the 4X makes a huge improvement in my comfortable reading situation. These classes sure beat spending a much larger amt. of money on the same magnification single vision glasses purchased from an eye glass store. I use these for computer & reading. My 6 year old granddaughter thinks I'm "fashionable". They may bend and not break - but the screws fell out right away!! I ended up putting a thin wire where the screw should be. There is nothing great about it. I was disappointed. I bought 2 pair and on one pair the plastic broke near the screw the first day I wore them. Three days later the second pair broke at the same place. Neither had recieved rough wear. I bought them because my young grand children sometimes play with my glasses, however, these did not last until the grand children visited! They came to me completely broken in half at the nose. No I would never buy again or recommend to anyone. They are very cheap!!!!!! I would never order these again! They are very cheap! They came in broken in half and the only thing I can say, is I did like the color of the frames! The day I received the eyeglasses I took them out of the pkg and was starting to put them on and one of the frames ( that goes over ear )broke off...I will have to return them.. They are very attractive but broke VERY EASILY with no stress on them other that putting them on. Had two pairs a total of four months, and both broke at the point where the bow connects with lens. Two eyeglass repairmen say they are not repairable, and I am left with two pair which I cannot use. Do not buy these! I ordered two pairs. One arrived broken in three places. Since they are shipped in their protective cases, I can only conclude that they were damaged before shipment. Not acceptable. They fell to the floor and broke. They were less than a month old. I LOVE LOVE LOVE these.. 4 Pairs Now..
A Must Have for Trigeminal Neuralgia. I could not even wear my glasses till I found these. Very feather weight.. I own 4 pairs.. I have had these and love them! I like the size of the lens, the shape of the frame and they appear to be light so they won't hurt your nose. I usually don't like a top edge frame because it distracts my eye at times. These are grea. Flexible frames and I liked color options. Flex Readers above 3.0x hard to find in local stores...especially in fun colors! I was looking for readers for me and my husband that would travel well and not get broken easily. Have had other pairs and loved them. Problem is so do my friends and I lose them. 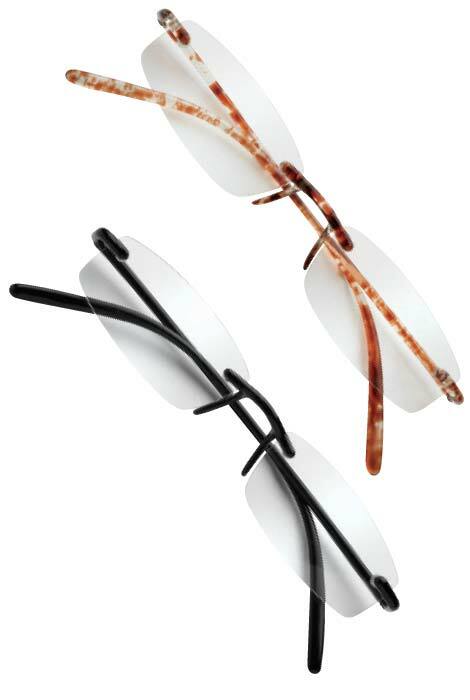 Needed higher resolutions and was attracted to the fact that these eyeglasses are flexible. I love these glasses, They look good and are very flexible. I JUST STARTED WEARING BI-FOCALS - AND I LIKE THE CLEAR EYE FRAMES AND LOVE THE FLEX STYLE!! 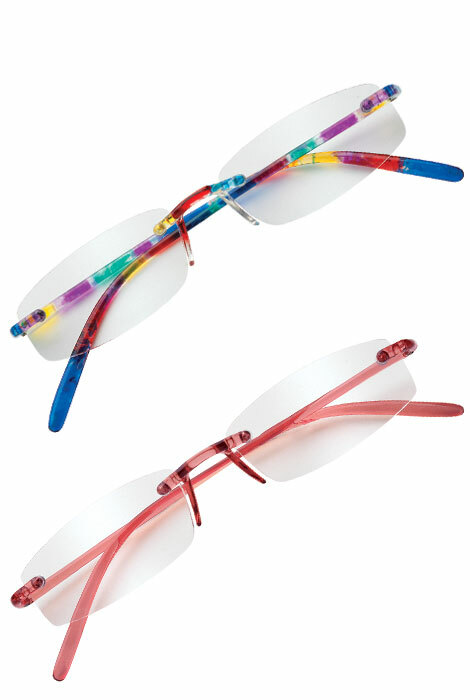 I liked that the glasses are flexible as well as colorful. I also like that it has a high number on the lenses. For example, you can't always find more than a 3.0 . I'm glad that this magazine had what I was looking for. flexible and lightweight. They are somewhat fragile because of this but I just keep buying replacements. Already bought them several years ago- good product, durable and well-made. Like the color and the rimless look. I think they are wonderful, that's why I am buying three pair for my home and three pair for my boat. I like the style of the glasses and the price. Lightweight, less prone to breakage. spare to take on vacation in case I break my glasses. I've had them for years. They travel great too. Needed a few more for each room in the house. So I won't continue to buy cheap glasses that break. I have a pair already and loved them. Like the flexibility. Less likely to break with use. I am ordering these for a 92-year-old loved one with macular degeneration. He needs large magnification in order to read.. Also, I want to find out how nearly-indestructible they are! What is the color choice that is shown with the Rainbow glasses in the photo? Is that not in stock? When will it be available or did you discintinue it? Looks like either pink or light red! BEST ANSWER: Thank you for your question. The colors are black, blue, green, rainbow and tortoise. We hope this information will be of help to you. No it does not help me, I asked you about the pink colored glasses that you don't have as one of your choices. Will you be getting that in stock again, and if so when? How many do you get? BEST ANSWER: Thank you for your question. You only get one pair. We hope this information will be of help to you. You only get one pair.